There are lectures and then there are lectures. 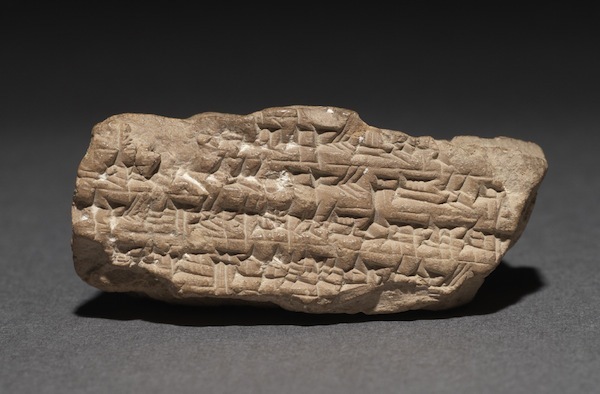 British Museum Director Neil Macgregor has perfected the art of lecturing and nowhere is this more apparent than in his speeches about the Cyrus Cylinder—one of the museum objects that defines our concept of democratic governance. On 6 March, His Excellency Sir Peter and Lady Westmacott hosted a select audience at the British Embassy in Washington DC to hear Neil speak about the relationship of this 2,500-yr old clay object to modern cultural and political issues. … As with all great legacies, Cyrus’s decree has had an almost Biblical propensity for re-interpretation. The Founding Fathers in the US urged the Cyrus philosophy of religious plurality and tolerance; the Jews heralded its message of freedom for their people, and even President Ahmadinejad pointed to its advocacy of helping the oppressed, namely the Palestinians. The cylinder is on display at the Smithsonian’s Sackler Gallery until 28 April. For me, the key point of this seminal lecture was the fact that Cyrus’s archenemy Alexander saw fit to weep at the grave of perhaps one of the greatest rulers in history. Whoever has seized upon the extraordinary legacy of this “political prophet”, knows one thing above all: that his message was not just universal but timeless. Alexander the Great wept at his tomb. Machiavelli and Caesar saw him as the ideal ruler. He’s celebrated in the Bible. And the stories are all confirmed in an ancient cylinder unearthed in 1879. “It really underscores the power of the object, how it speaks across time and space to so many different people,” says Freer|Sackler Chief Curator Massumeh Farhad. MONTAGNE: Now some have called this arrival of the Cyrus Cylinder to the U.S. a kind of soft diplomacy – a way to improve relations, if not to relations, then certain images. What do you think? Do you think it’ll have an effect? KARIMI: Yes. In the history of cultural policy, it will be mentioned somehow. When two states fail to talk to one another and the desire is within the population of both countries to start some dialogue going, objects like this serve a central purpose. That is, they get people together, they make possible conversations – if not at the state level – at least people to people conversations. The exhibition entitled, “The Cyrus Cylinder and Ancient Persia,” features quotes and historical artifacts that trace the generations of political thinkers inspired by Cyrus’s philosophy. Thomas Jefferson studied the life of Cyrus; he owned two copies of a biography of the king. Thomas Jefferson, the [British] museum director noted, read the biography of Cyrus before drafting the Constitution while King George V referred to Cyrus in approving the Balfour Declaration of 1917 in which the British government said it viewed with “favor the establishment in Palestine of a national home for the Jewish people.” Former US President Harry Truman is said to have exclaimed “I am Cyrus” when he went against the Washington establishment consensus and recognized the state of Israel. Jews were among those freed by Cyrus, who encouraged them to return and rebuild their temple at Jerusalem. Julian Raby, director of the Freer and Sackler museums, argues that it is the susceptibility of the object to interpretation that makes it fascinating. “For me, it is that element of contention that can provoke us to think,” he says. Raby acknowledges that the cylinder isn’t coming to the Sackler for new scholarly examination and study. Rather, it comes as a purely symbolic object, displayed in a two-room exhibition that focuses attention on the historical afterlife of Cyrus within Western culture. Nearly 350 guests from several continents gathered at the cocktail hour to view the gem of an exhibition curated by Dr John Curtis, with the involvement of Sackler’s Dr Massoumeh Farhad and Dr Julian Raby, the Gallery Director. The event also heralded the flagship project of IHF America—a diaspora cultural charity that began some 20 years ago in the UK. … A glamorous gathering of high-profile guests was especially appreciative of both the message and timing of this cultural diplomacy. In his speech Neil Macgregor [Director of the British Museum] recognized the desire of the diaspora Iranian community to move beyond the confines of today’s political axis, and CNN legend Christiane Amanpour affirmed the same dynamic in her after-dinner dialogue with the BM Director. Cyrus’ declarations of tolerance, justice and religious freedom inspired philosophers and policymakers for centuries. Scholars say it shows that Cyrus allowed displaced Jews to return to Jerusalem from exile in Babylon and to rebuild the Temple. In the fourth century B.C., the Greek historian and soldier Xenophon wrote “Cyropedia,” a text that portrays Cyrus as the ideal ruler and that greatly influenced Alexander the Great. Xenophon’s portrayal also carried weight with Renaissance and Enlightenment thinkers. Thomas Jefferson owned two copies of the cylinder and it influenced his writing of the U.S. Declaration of Independence. With an inaugural reception and dinner, and an exclusive viewing of the exhibition The Cyrus Cylinder and the Ancient Persia: A New Beginning, the US tour of the Cyrus Cylinder officially starts on March 5th. Between now and March 9th, which is when the exhibition is open to the public, press and media will have access to the exhibition and key individuals including curators from the British Museum and the Sackler Gallery, as well as trustees and management of IHF America, the official sponsor of the tour, for interviews, filming, and photography. We invite you to view a brief video and photos of the launch event at the Arthur M. Sackler Gallery. You can also see images of the Cyrus Cylinder exhibition at the Sackler Gallery. You can also visit the latest press coverage of the tour. Read the full article, A King’s Manifesto. The show, opening Saturday, marks the first U.S. appearance of one of the most celebrated objects from antiquity: the Cyrus Cylinder, a football-shaped relic inscribed with orders issued by King Cyrus the Great after his conquest of Babylon in 539 B.C., credited by Hebrew scripture for repatriating exiled Jews and allowing them to return to Jerusalem. Read the article: Cyrus Cylinder Makes First Appearance in DC. CNN: A 2600-year-old icon of freedom comes to the U.S. 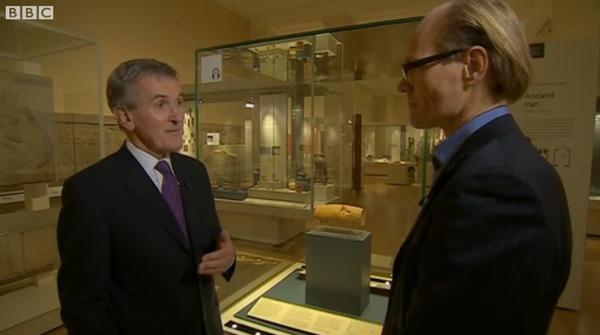 The Director of the British Museum, Neil MacGregor, writes a special piece for CNN on the Cyrus Cylinder Tour of the US. Read the article: A 2600-year-old icon of freedom comes to the United States. The hope, says the IHF, is that the exhibition — the cylinder and other objects — will appeal to the substantial community of expatriate Iranians living in the US (many of them refugees from the 1979 revolution) as well as to American Jews accustomed to the mutual hostility between the Islamic Republic and Israel, including outlandish Holocaust-denying statements by President Mahmoud Ahmadinejad. Read the article: Can a text from ancient Persia break down mistrust between enemies? And he is indeed right: It is possible to write a column about Iran without using the “N” word. The Cyrus Cylinder Tour has official started… On February 19th Iran Heritage Foundation (IHF) and the British Museum held a “send-off” (بدرقه) event at the British Museum as the Cyrus Cylinder gets ready to leave the UK for its US tour. The Cyrus Cylinder will be on display at five major museums across the US through this touring exhibition. The tour is arranged through a partnership between IHF America, the British Museum, and the Arthur M. Sackler Gallery (Smithsonian Institution) where the Cyrus Cylinder will debut on March 9th, 2013. Read the full Glasstire article on the Cyrus Cylinder US tour. The Cyrus Cylinder — the famous ancient Babylonian artifact that is one of the British Museum’s most prized possessions — will come to the Getty Villa in 2013 as part of a U.S. tour to five museums. The object is expected to go on display at the Getty Villa from Oct. 2 through Dec. 2, 2013. Read the full LA Times article on the Cyrus Cylinder Tour. آنچه که به منشور کوروش اهمیت ویژه ای می بخشد، اقدامات اعلام شده او به عنوان فرمانروای جدید بابل است. در این فرمان، دین و فرهنگ قوم مغلوب مورد تایید و احترام قرار گرفته و همچنین اعلام شده است که مردمی که پس از شکست از بابلیان، به عنوان برده به این سرزمین آورده شده بودند از آزادی دینی و فرهنگی برخوردار می شوند و می توانند به سرزمین اصلی خود بازگردند. Read the full BBC Persian article on the Cyrus Cylinder Tour. Read the full New York Times article on the Cyrus Cylinder Tour. For Jews and Christians, it is the object that – along with passages of Isaiah – records the end of Jewish exile in Babylon. In Iran, it has by turns been used as a symbol of the shah’s power and, most recently, when the cylinder toured to Tehran in 2010, was adopted as a rallying cry for Palestinian freedom by the president, Mahmoud Ahmadinejad. For others, it is the first declaration of human rights, and an international symbol of religious tolerance. For Neil MacGregor, director of the British Museum, to which it belongs, it is the “first press release”. You can read the full text of the BM press release, and we will follow up with the news coverage of the announcement. It is fascinating that 2600 years later, the Cyrus Cylinder still unites people from different backgrounds, ethnicities, and religions in cherishing the wisdom of tolerance. Iranians are proud of the Cyrus Cylinder because it was a Persian King who decided to break the tradition and allowed deported peoples to return home. 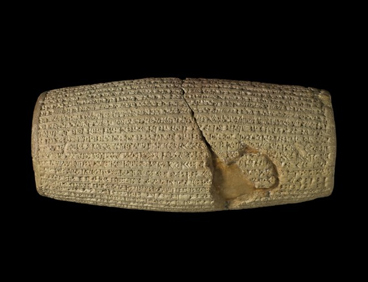 The Cyrus Cylinder has been called “the first declaration of human rights.” It is a barrel-shaped baked clay cylinder, and despite popular belief it’s not a big object: It’s about 23cm long and 10cm wide. The text on the Cylinder is a declaration about the Iran/Iraq war – not the one that started in 1980, but the one in 539 B.C., in the name of the Achaemenid king Cyrus the Great, resulting in the conquest of Babylon in 539. It establishes Cyrus as a king from a lineage of kings, and denounces the previous king of Babylon, but then it talks about peace. It tells how the god of Babylon – the conquered land – has chosen Cyrus to improve the lives of the Babylonians, and it talks about Cyrus’s efforts in repatriating displaced people and restoring temples across Mesopotamia, letting them worship the god of their choice, not the god of the conqueror. It tells the story of letting people living their lives even after their country was conquered, something that was not heard of at the time. In the ancient world and many years to come, conquering a new land would mean “owning” the land and its people.